Yesterday I posted on Facebook that I had finally locked in dates for my “Front Door” walk, by actually booking airline flights. My “Front Door” walk is a pilgrimage walk of some 3000kms. I’ll leave out the front door of my house in Mudgee in Central New South Wales, walk about 300kms to Sydney airport, then on Monday 12th of November I’ll fly to London Heathrow, walk from the airport to my place of birth, Wimbledon – from there I’ll walk down to Newhaven on the English coast, cross the channel by ferry, land in Dieppe on the French coast, walk from there to Chatres Cathedral, from there to Orleans in the Loire, from there I’ll drop down to the Veyzelay Camino and walk through to Santiago de Compostela, then to Cape Finisterre. The End of the Earth. So I’ll walk from my front door to the end of the earth – doesn’t that sound cool? I’ve booked to come back March1st next year. I estimate it will take me about 4 months, averaging 25kms a day. I want to do what the pilgrims used to do in ages past – walk out their front door and walk to Santiago. So why did I do that – publicly announce what I intend to do? Usually I don’t talk about things until after I’ve done them. The legendary bushman, RM Williams, once told me that he lived by the axiom: “To say is to do.” I never forgot that. And I’ve tried to live by it myself, too. To say is to do. Now that I’ve said it, I’ve bloody well got to do it! I’m going through an intense work phase at the moment, and that won’t abate until the end of October. So the walk will be my little reward to myself for these past couple of years of making the film and writing the books. But the real reason I posted yesterday is that I was excited! After thinking about this walk and planning it for so long, I finally put definite dates on it. Now in amongst everything else, I have to prepare for it. Which means getting fit again, because after all the recent travel I’ve lost fitness. And it means working out my route in detail, and thinking about what will be in my backpack. I’ll hit France and Spain in January and February – mid winter. Then there’s my knee. Last I checked I’d run out of cartilage in my knee joint. The orthopaedic surgeon told me to get WD40-type injections. I didn’t. He told me to wear a $1,500 brace every time I walk. I quickly got bored with that. I should get another MRI before I set off but I’m scared what it might reveal, so I won’t. It seems like I’m deliberately trying to make this walk as difficult for myself as possible. Bill, what an impressive walk it will be! You’ve addressed the pain before and you will do it again. Your “intuition” about what the MRI will reveal is probably spot on, but your intuition hasn’t advised you not to do the walk. So, no choice but to go for it! I look forward to your daily reports!! Now, get fit again! haha – thanks George. Still enough time to properly prepare – although I’m not going to do what I did before and over-train! That WD-40 is what they want to inject into my knees too….like you, I am not willing to do that..yet! Like you, my fitness level has gone down the sewer 🙁. By end of June we will be in our new home in Prince Edward County a peninsula in Eastern Ontario, 2 hours away from Toronto. Among vineyards and orchards and sand dunes I will find my walking routes again and hopefully by the time you are done with your longwalk, I will be fit again and am off to Europe, this time starting in Ireland. Wishing you that the Universe aligns all that is needed to guide you on the journey to come. Thanks Ingrid – I hope our paths do cross soon. Your new digs sound wonderful! We read your post while out at dinner. 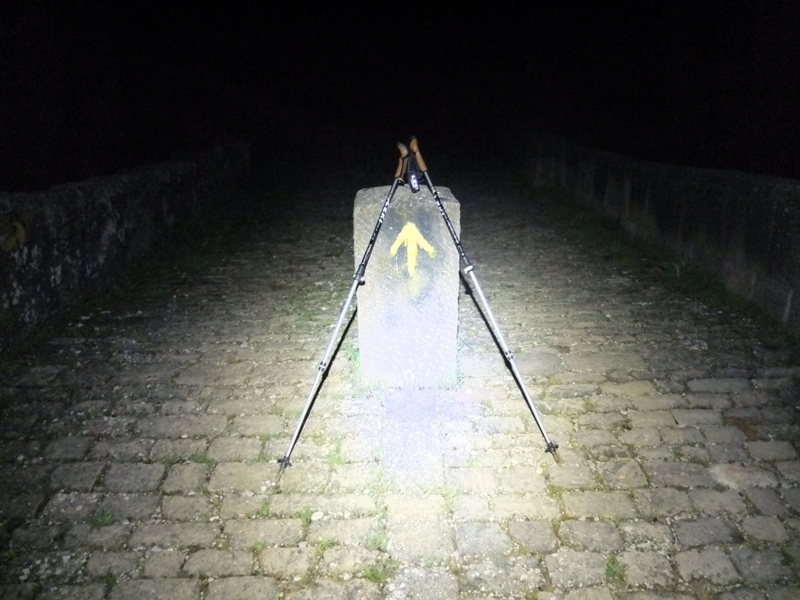 Dale is very jealous, has wanted to do Le Puy to Santiago for the last 4 1/2 years. You are very lucky to be able to spend more than 90 days in Europe! You may have gained a few pounds while in the US but that will melt away soon. I think you already are trained. You do seem to walk often and fast. Just remembered all the issues you had with blisters. This last camino we did earlier this month, I for the first time wore toe socks with another pair of Smart Wool socks over top. No blisters. Look up Injinji toe socks and maybe try a pair during your long training walks. Ditto what George said “looking forward to your daily reports”! Nearly lost all the kgs I put on in the US. Healthy eating, and sparse!, at home. I have a UK / EU passport hence my ability to stay more than 90 days! haha – hardly Steve! YOU do man!!! I feel another book in the making. Already have the title of the book Janet – yes it will be written, if only like the previous one to help me make sense of my madness!! Bravo Bill, if you need help and if I can do it I will do my best. Bises. Thanks Marie! I still have quite a few things to do before I head off!! Where there’s a will, there’s The Way! Take joy in every step in your training and also on those magical paths. Joy in every step – what a lovely thought Jenny!! Britta, many thanks – I think the first stage will be the hardest, and most dangerous. Planning, planning, planning and then some … and I’d imagine you’ll be doing lots of that. Can’t wait to see what you come up with in practical terms to walk and live through the terrain between Mudgee and Sydney … I thought it hard enough in a car many years ago!! The Tours Way is faster than the Vézelay, but the Vézelay is the more beautiful — and you’ll get to be a Pilgrim in your beloved Dordogne. You’ll discover France in ways that are invisible to non-pilgrims, and she will enrich you by surprising means too in strange preparation for your eventual rejoining of the Camino Francès proper, at Saint-Palais first and then into the crowd at SJPP. For your credenciales (you’ll need several), I’d advise getting about five, then gluing them together using the basic white glue (the wood/paper glue used in primary school arts classes) to make a single, good thick one. … but the more common French one (that they give to pilgrims at Arles and SJPP) is a very good one as well, and if the Oz one from the Friends of the Camino in Sydney is useful for such purposes, that’ll be fine too !! The thing that’s good about the models provided at Lourdes (at Paris too BTW) and the one from SJPP is that they’re good thick paper stock, resilient to rain getting onto them, and also that both sides of the credencial can be used for one’s stamps. Buen Camino, my friend !! Many thanks Julian. I will ask for your help with route info as it gets closer! You can’t walk to T2 or T3, the tunnel is vehicles only and there are signs up saying no pedestrians. So basically, you should aim for a flight arriving at Heathrow Terminal 4 — which would be the exact right place to arrive at and start walking almost immediately (if so desired). And looking at Google maps, it does seem as though your best bet would to get to Tereminal 4 (walkable but not fun from T5), take a short walk from there (or from your hotel there if you need a rest) to the footpath (!!!) leading out from the road junction right bang next to it (need to jump over a barrier) leading to the Duke of Northumberland’s River, and follow a footpath along that (seems possible) to North Feltham. Then aim for this — https://www.carfreewalks.org/walks/230/the_river_crane_walk — into Twickenham, through that to Richmond Park, Wimbledon Common, Wimbledon. A far nicer walk out from the airport than I thought it might be !!! That’s fantastic to know Julian – thank you! Right at the moment I don’t have any time to do any research at all – I have this deadline on my book which I’m behind on. Any further research you could offer would be greatly appreciated, particularly from Dieppe to Giverney to Chatres, then to Orleans then where to best join the Vezelay. Thanks!